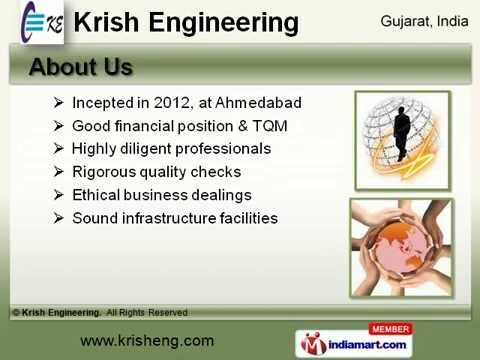 Welcome to Krish Engineering. Manufacturer and Supplier of Engineering Products. The company was incepted in the year 2012, at Ahmedabad. Good financial position and TQM make us different from others. Hari Om Engineering and Plaza Indulson are some of our esteemed clients and we are backed by customized solutions and competitive prices. We offer a vast range of Industrial Reactors, Pressure Vessels and Storage Tanks. Our Hydraulic Power Packs, Air Reservoirs and Chemical Silos are best in the industry amongst others. Deaerating Tanks, Heavy Duty Pressure and M S Vessels offered by us are superior in performance. We offer Industrial, Pressure and Process Tanks that are available at industry leading prices. Along with that we offer Air Tanks, Hydraulic and Pneumatic Machines that are a class apart. We also provide Autoclaves, Resin and Tyre Recycling Plants that are extremely reliable.